Among the many treasures available in India, a universally beloved one is chikankari. Among the many treasures available in India, a universally beloved one is chikankari. This type of embroidery originates in Lucknow and a famous folklore avers it was introduced to India from Persia by Noor Jehan, Mughal emperor Jehangir’s wife. Chikan gets its name from the Persian word ‘chikeen’, which means ‘running thread through cloth’. expensive. It is naturally a favourite of Indian and international elite. The great revival of chikankari in modern times is credited to Abu Jani and Sandeep Khosla, whose three-decade old label Abu-Sandeep first began using original Lucknowi artisans to make intricate and elaborate embroideries in couture and occasion wear. Soon the Abu-Sandeep label was on eveyone’s lips and labourious. Chikankari came to be known as its signature. Tarun Tahiliani soon picked up chikankari as his style staple as an extension of Mughal influences in his work. His chikan is also painstaking, elaborate and beautiful, but often lost among the designer’s penchant for modernist draping methods and digital prints. Chikankari’s popularity has sometimes been its bugbear too. Modern machines have been created to replicate the embroidery. They are cheaper and faster and have eaten away the rich complications of hand-work. Various NGOs have been lured by quick benefit and succumbed to the easy business in poor quality machine work. Of the 36 stitches, only six are used regularly today. NGOs have assisted in the opening of many Lucknow chikan stores across India. These use the chikankari block prints with ordinary surface embroidery, sometimes just the plain aari stitch. Unaware consumers are plenty, and purchase quotidian machine embroidery in the glorious name of chikankari. Some designers continue to use chikankari, though many offer substandard quality of embroidery and common floral or mango motifs. Manish Malhotra brings out one annual line of chikankari made by actor and activist Shabana Azmi’s NGO in Mijwan. Malhotra’s line comprises simple motifs and not the best finishes, but married with trendy elements, like a sequinned gold shift blouse over a lehenga. Shon Randhawa’s Patine is another label that does a lot of chikankari even though it doesn’t innovate in its application. The Ahilaya boutiques in Mumbai’s Colaba and Santacruz, run by three sisters Nagma, Sana and Farah Ansari, have succeeded in taking original chikan embroideries to modern styles, like blouses and dresses. They are a rage with celebrities such as Gwyneth Paltrow and Sienna Miller. The Neemrana boutiques also do a more commercial line of chikan. Very cheap and commercialised variations are found at Lucknow Chikan House shops across the country. Even Amazon sells chikan kurtis for just a few hundred rupees. 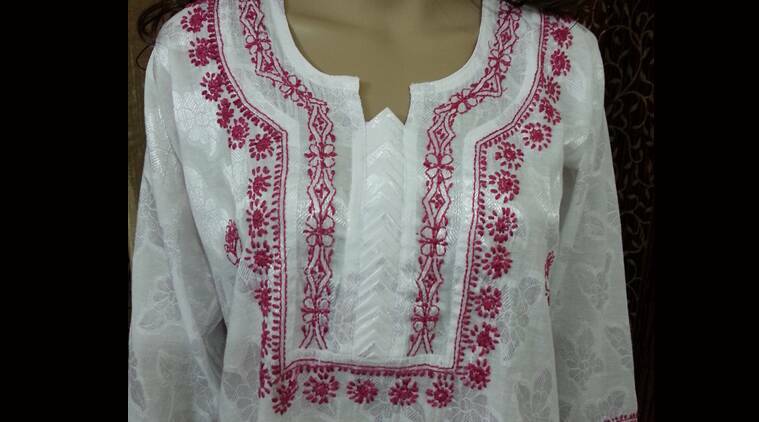 Chikan’s fame and various governmental initiatives have kept the demand of chikankari growing. It also gives employment to over 2.5 lakh Muslim women in and around Lucknow, since their men have taken on more aspirational jobs. Yet, much remains to be done in terms of a sustainable industry and profitable employment. But mostly, it’s the poorer versions of chikankari that take away from the sophistication of this art.